Outdoor entertaining is a quintessential summer activity in Southern California, but the warm weather and sunshine that draw so many to this area can make it difficult to keep your guests cool and comfortable. To help you create outdoor living areas that you, your family and your guests can enjoy throughout the year, here are nine things you can do to keep cool on hot days. One easy way to keep your guests cooler without investing money in your outdoor living areas is to simply schedule your gatherings later in the day. With some well-designed lighting, you and your guests can fully enjoy your entertaining areas after the sun goes down. This allows you to host outdoor parties without worrying about the sun or heat putting a damper on your soiree. If you are concerned with your party going too late into the night, or if children with bedtimes will be attending, start your party around 5:00pm so that the temperature has had time to drop a bit, and families with children will be able to enjoy hours of fun before it is time to go. 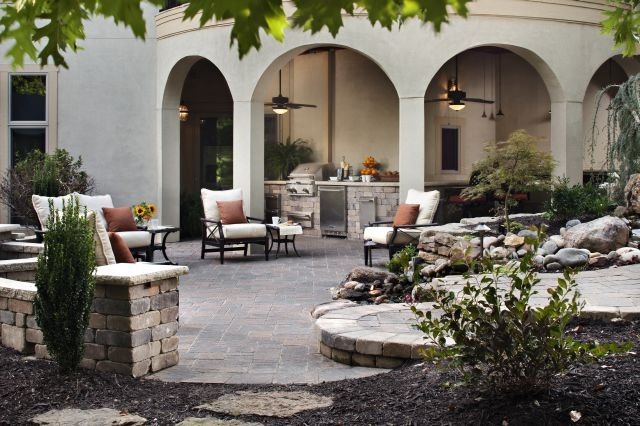 Fire pits and patio fireplaces provide a focal point, a central gathering place and a welcoming environment at parties, but when the weather heats up, it might be best to forgo the fire features. If you really want to have an inviting fire to help set the mood, hold off on lighting it until after dark and after the temperature has dropped significantly. You should also make sure you have plenty of seating options that are away from the fire feature to allow guests to avoid the heat, if desired. Sitting away from the fire still allows you and your guests to enjoy the light and ambiance without feeling the heat. Keep in mind that the hotter, drier months of summer can also increase the risk of danger or damage, so be sure to follow basic safety precautions when using your fire feature. Keeping cooking on your patio to a minimum can help you avoid excessive heat outside, just like minimal indoor cooking can help keep your home cooler on hot days. However, summer gatherings are often based around backyard cookouts, and this is the season when most of us want to use our barbecue grills as often as possible. The good thing about this is that opting to prepare meals outdoors will help keep your house cooler and more comfortable when you head in for the night. The bad thing is that it can make an already hot day even hotter. If you have a portable barbecue grill, you can move it away from your main outdoor living areas to allow your guests to mingle away from the heat. If you have a stationary outdoor kitchen, encourage your guests to hang out elsewhere by creating inviting seating areas away from the heat of the grill. Much like the way summer gatherings are centered around grilling, they also tend to be centered around imbibing beer and other adult beverages that worsen dehydration. And while the adults are enjoying beer or wine, the kids are usually drinking sodas, which are not nearly as hydrating as good, old-fashioned water. Encourage your guests to drink water by making it readily available wherever they can grab a drink. Make sure your beer and soda coolers or buckets also have some bottled water, and make it more appealing by filling a large drink dispenser with water and adding sliced lemons, limes, oranges or cucumber. Tea has caffeine, so it is not as hydrating as water, but serving iced tea can also help keep your guests hydrated and cool. If you are fortunate enough to have lots of shade trees or covered patios, use this to your benefit. Even areas near fences or structures that are shaded during certain parts of the day are an advantage and can be put to good use for parties. Create various groups of seating options set in these shady areas to provide cooler, comfortable spots where your guests can gather for smaller conversations or take a break from the action and cool off. Making sure you have plenty of shade is incredibly important, so if shade is not one of the main features of your outdoor entertaining areas, you may need to add some. If you have a covered patio, this is a great start, but if you are hosting a party with more folks than can comfortably fit in that outdoor living space, you will need to provide shade elsewhere to protect your guests from the sun. If you have the time and the budget, installing a gazebo, covering additional existing patios or installing new patios with covers are all great options that will enhance your outdoor living areas and can even increase the value of your home. If your budget allows, you might also consider installing a sun room or screened porch that can function as a transitional space between your indoor and outdoor entertaining areas. This will provide an additional, shaded area for your guests to mingle and allows additional cooling options, such as ceiling fans — or air conditioning, if it is a sun room with solid walls. Permanent awnings are another option, if you have enough time to have one installed before your next gathering. If you need to quickly create shade for an upcoming party, shade sails are an easy, economical option that you can purchase locally and install quickly. Umbrellas can vary quite a bit in price, but this option instantly provides shade with very little time spent setting them up. You can make a quick trip to your local home improvement store the day of your party and have plenty of time to get home and set up one or more umbrellas before your guests arrive. Another easy shade option is to set up a canopy. Of course, there are lots of different canopy options available, but there are basically two categories from which to choose. You can either opt for a permanent canopy that will be more expensive and take more time to install but will be more visually appealing, or you can opt for a portable canopy that is already assembled and is designed to quickly and easily open for instant shade. If you host parties very often, you may want to consider both of these options, particularly since portable canopies can be stored in a shed or garage when not in use and can also be taken to gatherings at beaches, parks or the houses of other family members when the party is not at your home. Misters are an option that are worth mentioning, since they are very affordable and provide an enjoyable, cooling mist. However, any patio cooling option that uses water should really be used as a last resort in our current state of drought. A patio mister system like the one in the above photograph can be purchased for less than $20.00 on the Home Depot website, which shows just how affordable this option can be. According to the product description for this mister, it can be attached to any garden hose or faucet and can reduce the air temperature in the immediate area by up to 20 degrees. That is pretty impressive for such an inexpensive solution but, again, it would be best to keep this effective option in mind for some point in the future when conserving water is not quite as important. 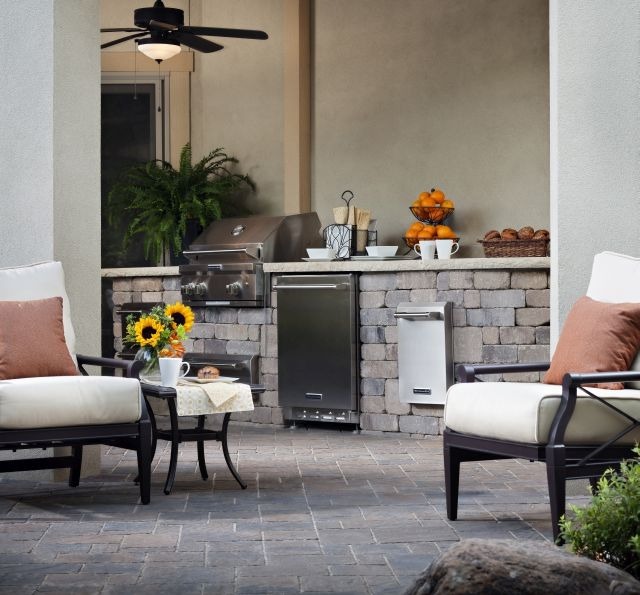 Keeping the air moving is an effective way to keep your outdoor living areas cooler, which makes patio fans a necessity for any homeowner who hosts parties during the hotter summer months. Ceiling fans are readily available for covered patios, oscillating stand fans designed for outdoor use can be found at home improvement stores, and even a regular box fan can make a big difference on a hot day. Ceiling fans are often most attractive but are also usually more expensive. This permanent option is good for homeowners with covered patios or sun rooms and is a particularly good choice for people who frequently entertain or who spend a lot of time in their outdoor living areas. Portable fans are usually more affordable, can be stored when not in use and can be moved around your yard or entertaining spaces as needed. This type of flexibility will appeal to party hosts with more than one outdoor entertaining area and is also a good choice for folks who need a cooling option they can purchase the same day and immediately start enjoying. 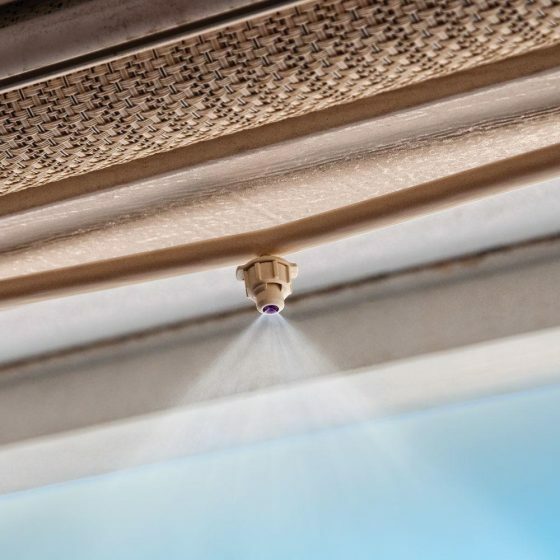 Portable misting fans can be particularly effective but, like patio misting systems, they require water, which makes them a less appealing option during droughts. One option that should not be overlooked is an umbrella fan. Battery-operated and solar-powered umbrella fans are available that fit around the umbrella pole and can be used to keep the air moving and the temperature cooler for guests sitting under the umbrella. There are a few options available in the world of portable coolers, but most outdoor solutions are some form of evaporative cooler that either needs to be plugged in to an electrical outlet or has a rechargeable battery. Some are similar to the portable coolers you have likely seen for sale for inside your home. 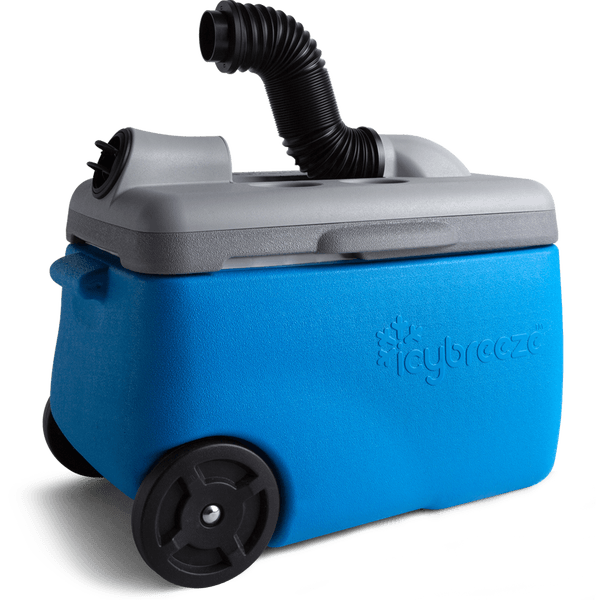 Others are a bit more unique, like the icybreeze portable cooler pictured above. This patio cooling solution is just as portable as an ice chest, particularly because that is essentially what it is. This unique option can keep your drinks cold and cool off your guests at the same time, and it has a rechargeable battery that allows you to use it at the beach or park, while tailgating or while camping. 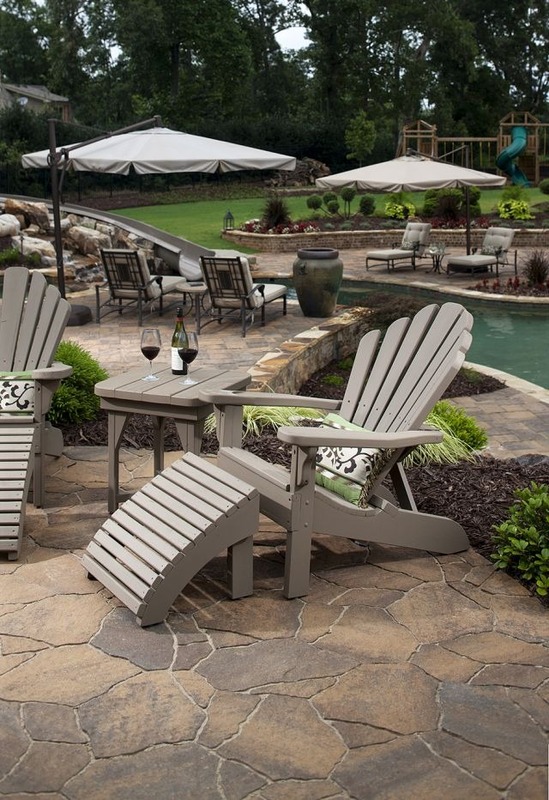 How do you keep your outdoor living areas cool and comfortable during summer?